In Thailand, younger people are brought up to respect their elders. This article, and the next few postings, present the views of a British golfer who arrived in Thailand in the mid- 70’s. He was already a single figure handicapper and understandably retains great affection and respect for the few golf courses which existed at that time. He explains which Thailand golf courses are his favorites, why he liked them then, and loves them still today. Unlike retired generals classic golf courses don’t fade away. With loving care they just get better providing untold pleasure for successive generations. Thirty five years ago, had I been asked to nominate my favorite 4-5 golf courses in Thailand it would have been easy – there were only 4 or 5 courses. Strangely, despite the incredible development of over 250 fine, modern courses designed by such greats as Nicklaus, Norman, Faldo, Robert Trent-Jones etc., the originals are still very high on my list of favorite venues. The more recently built Thai golf courses I favor are not the cosmetic contrived ‘American’ type layouts, which also tend to be the most expensive, but the courses which are more Thai in character and in hospitality. 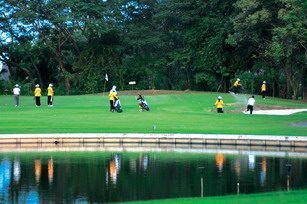 After all golf in Thailand is more than a rushed competitive slog to get round in 3½ hours. It’s a complete Thai day out. It’s supposed to be fun – and at these old favorites it really is. These completely re-modeled 18 holes retains everything I loved about the old course including the same basic layout but, as if someone had waved a magic wand, it has been transformed from an uncut diamond into a fine, many faceted emerald, very different, and even more interesting. The 1st hole (per 4) is perhaps the finest opening hole in Thailand. From the competition tee it’s a good 3 wood, a driver for most, to the dog leg corner. With water left right and dead ahead to catch the over hit, it’s a great relief to find a safe lie on the fairway facing an equally challenging 5 or 6 iron to the green. That’s just the beginning. Water hazards play a big part on almost every hole so accuracy is paramount throughout the round. The boys selling used balls do a good trade most days. A 36-handicap friend of mine lost 17 balls in one round. The greens, certainly among the best in Thailand, are fast and true. Like most older layouts the par 4’s and 5’s are long. At 230 yards the 14th par 3 is long enough for Tiger Woods and it’s well guarded by bunkers. If you want to sharpen your long irons and fairway woods, this is the place for you. The majestic old trees have been retained and the course is both shady and breezy. The staff on reception, starters, caddies drink huts and even the ground staff, all have a smile and a friendly word. The food in the restaurant is excellent too. I try to play KrungThep Kreetha at least once a week. It’s a tonic. To be continued, but remember to Respect “The Elders”!